Plastics, Benjamin? Not in Somerville, not now. On Jan. 14, the city announced that residents could no longer put recyclables in plastic shopping bags, because the recycling plant can't handle them. Paradoxically, the annoucement came two days after the city started requiring large businesses to recycle those self-same bags. A drop in the price of recycled plastic caused the changes at the curb - or, to be accurate, enforced the changes. 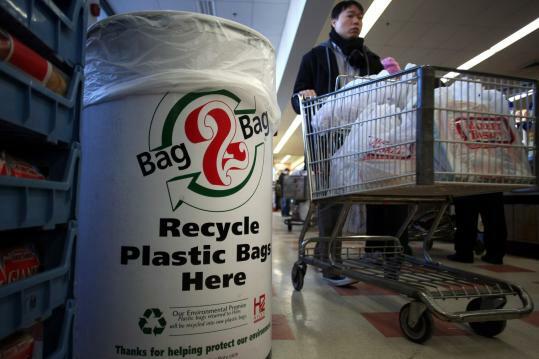 Casella Waste Systems Inc., the city's recycling contractor, never did accept plastic bags, said Sean Murphy, Somerville's director of constituent services. "When the stuff was making money, they were willing to look the other way," said David Lutes, director of the city's Office of Sustainability and Environment. Now it's simply not worth the trouble. The city's hurting, too. With recycling, Somerville was always in the red, spending $460,899 in 2008 on 4,328 tons. However, in the past some money came back into the coffers via the sale of recycled goods, about $120,000 in the 2007-'08 fiscal year, Lutes estimated. But "the bottom fell out" of the plastics market last summer, he said. (The store ordinance passed in early July.) The value of recycled paper soon followed. With less trade, there's less need for cardboard; with newspaper circulation down, less need for newsprint. The city had been considering "single-stream" recycling, under which paper and plastic go into the same bin. The price drops put the kibosh on that, Mayor Joe Curtatone said in December. Residents may still pack paper and containers in clear plastic bags, a concession from Casella to reduce litter, Lutes said. Pizza boxes and other food-stained paper can't be recycled. Neither can Styrofoam "packing peanuts." It's possible to recycle plastic shopping bags, Lutes said, but "my understanding is it's much more expensive," especially when they're covered with drips of stale Pepsi and other household gunk. Companies want clean bags, like the barrels-ful a large store can collect. The city's commercial plastic bag ordinance specifies that stores with 5,000 or more square feet must collect and recycle all clean "plastic carryout bags." It's not hard to believe. On a recent morning, the front of the store was a bumper car rink of shopping carts, each loaded with white plastic bags. The market beat the city to the punch on plastic-bag recycling, introducing the option well over a year ago, said Dunleavy, who added that customers appeared to like the service. Many, he said, "want to not use plastic bags at all." So far, that has translated to a press release online and some training for the recycling pickup crew (not employed by Casella), Murphy said. He planned to use the city's 311 information system to get the word out, but first had to learn how big a problem the plastic bags actually were. He worried that the bags indicated larger problems for the recycling business. The cost drop "just doesn't bode well" for plastic recycling, he said. "If there's not value [in it] . . . it's not as attractive for them to collect." Maureen Barillaro, a volunteer with Somerville Climate Action, was concerned that the crackdown might make recycling seem too big a hassle. In her neighborhood, she'd observed, many people don't put out their recycling correctly. That said, she thought that recycling was supposed to make people think. "If you want to throw something away and not think about it, that's what the trash is for," she said. Lutes said residents' care "will help us maintain our costs, and it will hopefully help on the revenue side," he said. Concerned citizens can take comfort in knowing that recycling is still worth the city's while. Even in today's market, Lutes said, it's cheaper than throwing all those tomato cans, junk mail, and water bottles in the trash.